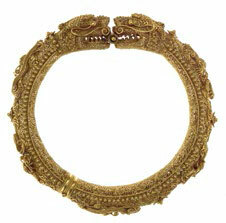 A gold filigree hinged bangle, formed as two dragons, joined at their muzzles by a movable pin. The domed sides of the bangle are decorated with floral scrolls. The dragon’s heads are realistically modelled with horns, bulging eyes and strong jaws. The gold filigree is overall well polished. This intricately designed filigree gold bangle is based on two dragons playing with a magic pearl, which has for centuries been an auspicious motif in Chinese iconography. Bangles of a similar design are known to have been made in other materials and were worn by royal consorts in the Qing Court, such as a jadeite bangle in the National Palace Museum, Taipei. This type of exquisite filigree work was famously made in the Guangdong silversmith workshops, located in the south of China. Several similar dragon bangles are known to have been brought back to the United States in the mid-19th century, such as an almost identical example in the collection of the China Trade Museum, illustrated in the publication Chinese Export Silver – A Legacy of Luxury. 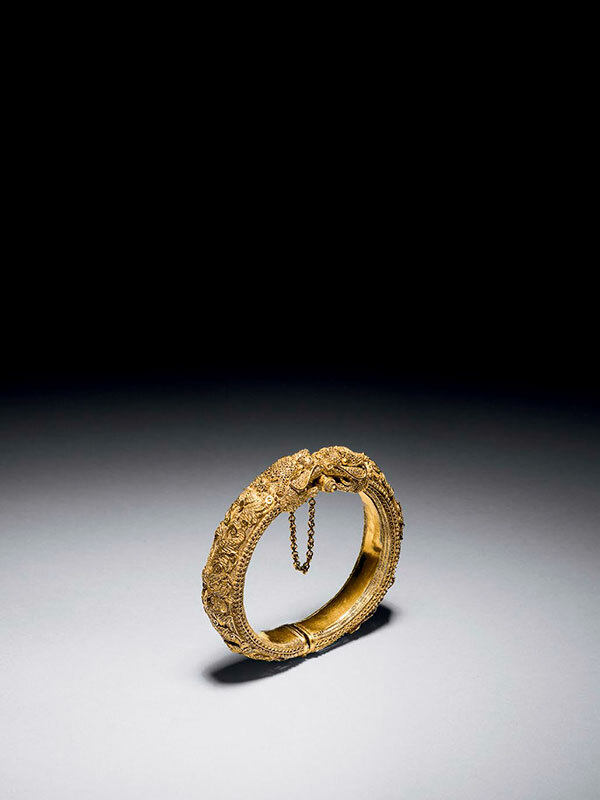 Another closely comparable gold filigree bangle, dated to the late 18th – 19th century, is in the Freer and Sackler Gallery, the Smithsonian’s Museum of Asian Art (fig. 1). A pair of solid gold bangles and two pairs of gold bracelets with a similar design were in the Qing Court collection and are now in the Palace Museum, Beijing.